The deity Ise no Okami is worshiped here. 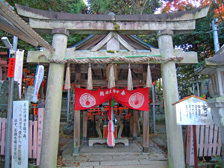 A stone torii gateway called Nunetorii stands at the entrance of the sacred area. This gate has an exceptional decoration called sasutsuka, where the center boards (gakuzuka) are fashioned in a gassho style resembling the position of two hands brought together in prayer.